To celebrate Valentines Day I wanted to spread the love and have 3 bottles of Vera Wang Lovestruck Perfume to giveaway to Three lucky Perfectly Polished readers worth £62 each! 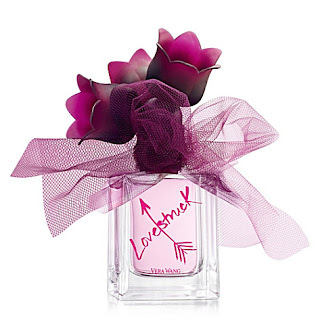 Inspired by a modern day twist on Romeo & Juliet, Lovestruck by Vera Wang, an intoxicating floral that captures the feeling of a woman who is struck by love, captivated by passion. The sparkling floral scent is brilliantly complemented by mouthwatering pink guava and mandarin, followed by a delicate mix of tuberose and lotus blossom. I have decided to award one bottle to a GFC Subscriber, one bottle to a Facebook Page Fan & One bottle to a Newsletter Subscriber! This is open to all Perfectly Polished followers world wide and shall close on 14th February 2012 at 11pm (UK Time). 1. You must follow Perfectly Polished through GFC, 'Like' Facebook Page, or Subscribe to my monthly Newsletter. 2. If you subscribe to all three then you have more chance of winning! Just tweeted you =] - http://twitter.com/#!/illbey0urstar/status/158921517932085248. Already 'liked' you on facebook. Thanks for the giveaway! Fingers crossed. Thankyou for running this giveaway. I'm a GFC follower and a twitter follower- @LAAUREN_LOVE. Im following on here, FB & Twitter as well as subscribed to your newsletter. Hi!!! Enter me in the give away!!! i do all three and have tweeted :) thankyou! Ahhhhhh this is such an exciting giveaway!!! I absolutly love the smell of this perfume and the bottle is gorgeous! It always makes me think of Leighton Meester as well since she did the advert for it. Hi, i follow you on GFC and twitter, my twitter name is @barbiet7. hahaha in a non stalkerish way of course! I follow on GFC misscharley_x I think? Or Bella beaute_x or charley-Elizabeth I don't know what it is. Great giveaway, I already wear Vera Wang Princess so would be lovely to try Lovestruck! Please put the topic of valentine's day purses in your blog that will make it impressive as well as interesting. and followed on twitter @vinny188 and tweeted. Liked on Facebook, follwing on GFC, following on Twitter and tweeted the message, signed up to newsletter. I follow through GFC and I also tweeted! I liked on facebok, followed on Twitter, retweeted and signed up to newsletter. please enter me, liked on facebook as alana walker, followed on twitter as LucyWalker15 and tweeted comp. also signed up for newsletter. I'm following through GFC as Fiaso. I've also followed you and tweeted about this giveaway as @Miss_Sofia_Q on twitter. Liked on Facebook: Sofia Q Lidaifos. Following you on facebook (Lorraine Partyn) and twitter @lorpart. also signed up for newsletter. Need to add this to my Vera Wang collection! Hi! i follow on twitter as @olivia280177 and have tweeted. I've done all the three way. 2. I like your FB page as Kartika margaretha. sorry forgot to write this..
Would love to win! tampeezy on twitter & I also sent out a tweet! Following on facebook and subscribed to newsletter. I'm already following you with GFC as12 Kazuko12 and on Twitter as @12kazuko12, and liked your Facebook page as Annabel Lee, signed up for the newsletter and tweeted. I love this perfume but it's so expensive! So please enter me, keeping everything crossed! follow on twitter @pink_lady123 and tweeted. WOW Lovely giveaway :-) Heard so much about Vera Wang, and it smells great :). I have tweeted this, dont do facebook tho, hope this dont exclude me too much. My daughter-in law would love this, if i win it i will give it to her. she deserves it for looking after mey son sooooo well! GFC: Ciara M - followed. I have followed on Twitter @FlorrieFloyd. I follow you on twitter (@bonestormer13) , like you on facebook and have subscribed to your newsletter hope that's enough as I don't have google friends connect. This is a truely fantastic prize and looks so inviting.Have liked on facebook following blog and subscibed to e-mail. Hi, I've liked you on FB, followed on Twitter and twittered the comp (xxcarollxx) and subscribed to the newsletter. I would love to win this :). Thank you . I am following on GFC as M.
Followed Perfectly Polished through GFC, 'Liked' Facebook Page, and Subscribed to your monthly Newsletter. I love that parfume,Its my absolute favorite!! I subscribed to newsletter, look forward to receiving it. This is a great giveaway. Hi, I'm following you on Facebook as Francesca Light-Wilson, I am also following you on Twitter as @LoveWinning and I've tweeted about the competition too! i have subscribed to emails. Have followed you for ages on twitter ;) @LondonBirdLucy and now tweeting your current competition till the end of your comp! You must follow Perfectly Polished through GFC, 'Like' Facebook Page, or Subscribe to my monthly Newsletter. Hi Subscribed to all three!